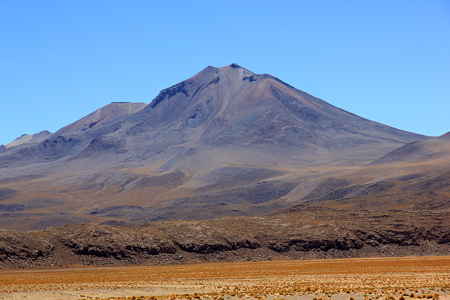 This mountain is located 12 kilometer east of the Chile/Bolivia border, south of the better known mountain Cerro Ollague, located near the small border community (border crossing) with the same name. There are several large mountains (all volcanos) in this area. There are many small dirt roads in the area, access from the small town of Ollague is pretty straightforward. Access to this mountain is best from a north-south running dirt road that runs east of Canapa and west of Cerro Tomasamil, a big mountain located just a few kilometer further north. A small dirt road forks off approximately at location S21.4309, W67.9987. 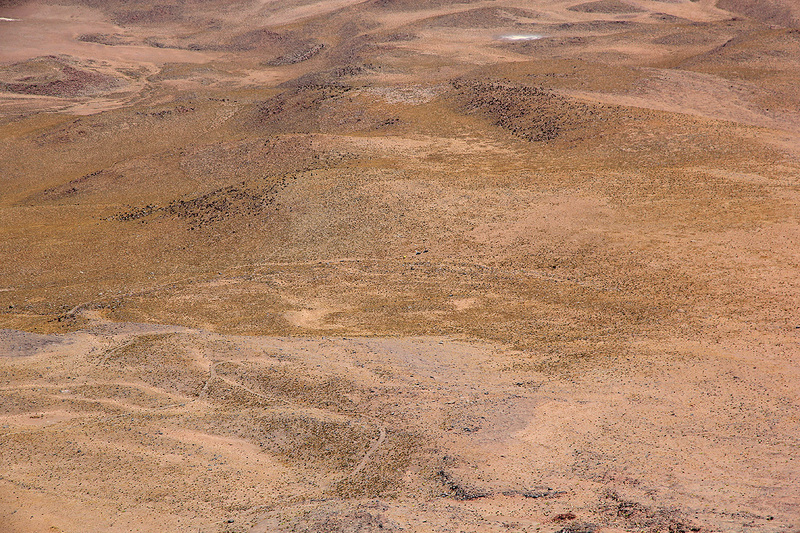 Actually, this is already a bit west of the road, but the area is flat and several alternative tracks can be used to connect from the main road to this point. Follow this small road as it winds its way up the lower slopes of Canapa. We drove to location S21:27.128 W068:02.239, elevation about 4660 meter, this is a good area for a base camp and trailhead. The road does go a bit further/higher, but it is not immediate that driving further will provide any better access. Head uphill (slightly right) in order to access the very distinct ridge that runs up towards the summit. Follow this ridge until it tops out on a somewhat flat area just below the final summit ridge. The footing is sometimes loose talus and the ascent is generally a bit cumbersome. Ascend the final slope, perhaps most easily starting on the lower left side, then traversing somewhat right before heading pretty much directly uphill. The highest point on the quite level summit ridge is off to your right (when ascending the ridge as described). Head over to the summit marked with a few rocks and a wooden pole. It is more convenient to descend down the loose scree slopes rather than on the ridge. We left camp at 0630 for the first quite substantial ascent since we started this trip. The terrain was quite a bit loose and required a good effort. We arrived at the summit at 1225, almost 6 hours. A great viewpoint with good scenery across to Cerro Ollague as well as Cerro Tomasamil. We had no hurry and the sun was warm at mid-day. We spent a full hour at the summit, finally leaving by 1325. 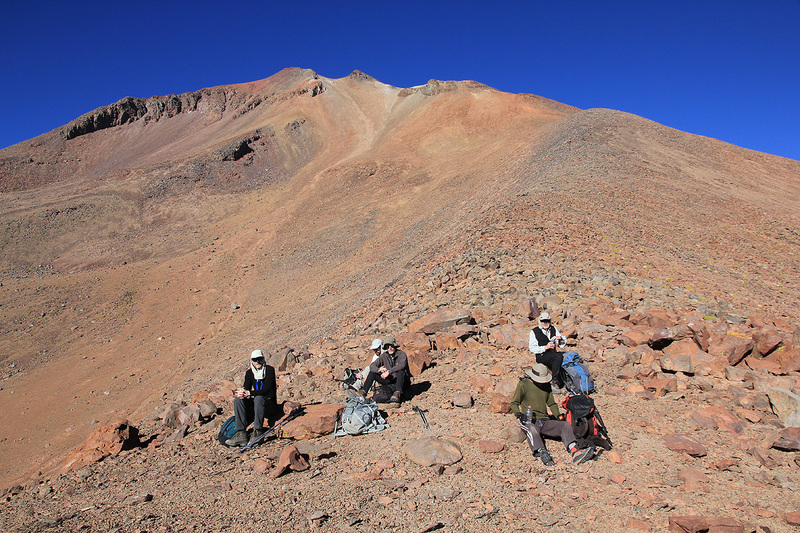 It is much easier to descend on loose scree and we were back at camp by 1600. 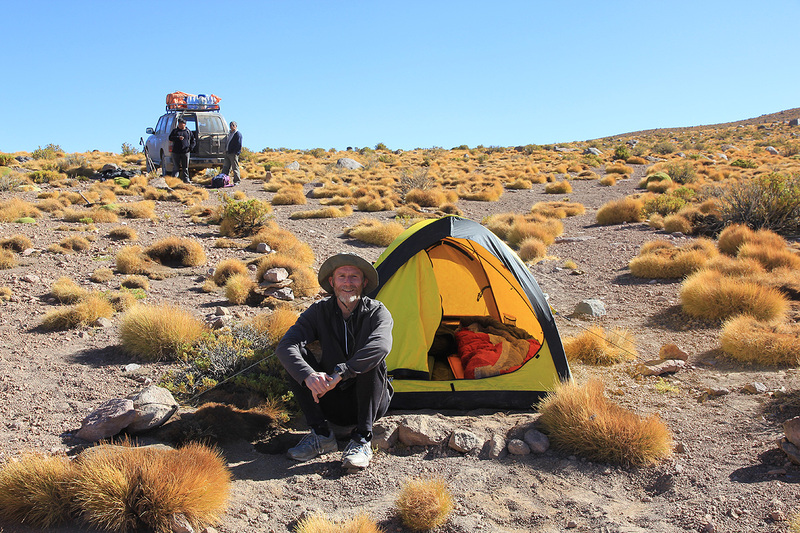 A nice camp site on the lower slopes of Cerros Cañapa. 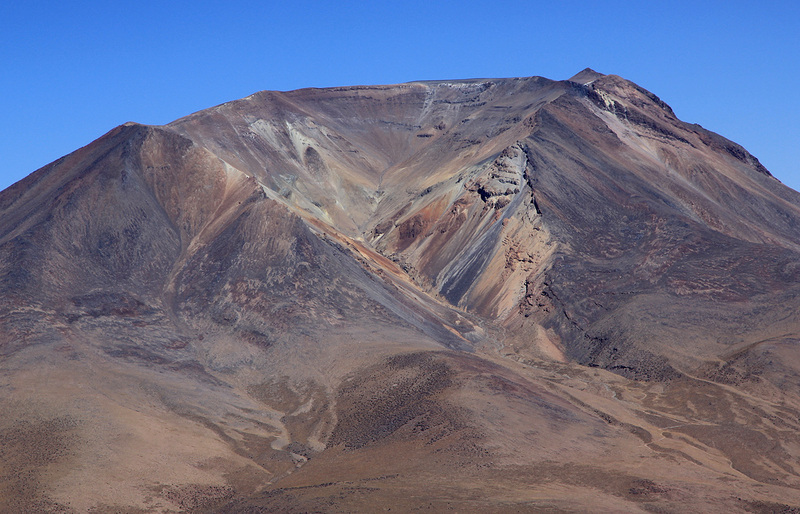 A look across to Cerro Caquella, 5941m. A rest on the ridge.